America’s global image plummeted following the election of President Donald Trump, amid widespread opposition to his administration’s policies and a widely shared lack of confidence in his leadership. Now, as the second anniversary of Trump’s election approaches, a new 25-nation Pew Research Center survey finds that Trump’s international image remains poor, while ratings for the United States are much lower than during Barack Obama’s presidency. The poll also finds that international publics express significant concerns about America’s role in world affairs. Large majorities say the U.S. doesn’t take into account the interests of countries like theirs when making foreign policy decisions. Many believe the U.S. is doing less to help solve major global challenges than it used to. And there are signs that American soft power is waning as well, including the fact that, while the U.S. maintains its reputation for respecting individual liberty, fewer believe this than a decade ago. Critical views are also widespread among America’s closest neighbors. Only 25% of Canadians rate Trump positively, more than six-in-ten (63%) say the U.S. is doing less than in the past to address global problems, and 82% think the U.S. ignores Canada’s interests when making policy. 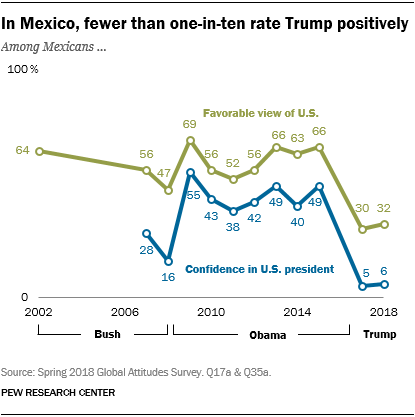 Meanwhile, Trump’s lowest ratings on the survey are found in Mexico, where just 6% express confidence in his leadership. One exception to this pattern is Israel. 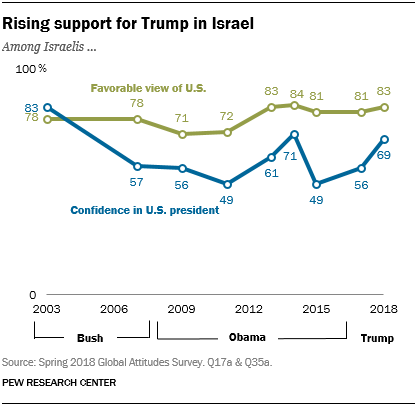 After a year in which the Trump administration generated international controversy by moving the U.S. Embassy from Tel Aviv to Jerusalem, his positive rating jumped to 69%, up from 56% in 2017. These are among the major findings from a new Pew Research Center survey conducted among 26,112 respondents in 25 countries from May 20 to Aug. 12, 2018. Chapters 3, 4 and 5 use additional data from a Pew Research Center survey of 1,500 U.S. adults conducted from May 14 to June 15, 2018. 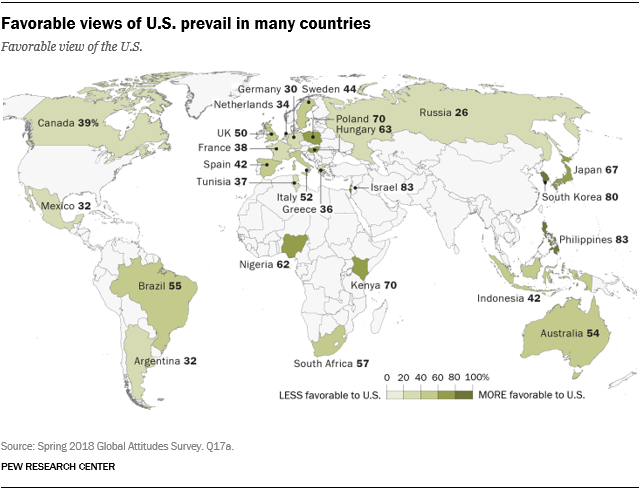 Although perceptions of the U.S. are on balance positive, they vary considerably among the nations surveyed. Ten of the 25 countries in this year’s survey are European Union member states, and across these EU nations a median of just 43% offer a favorable opinion of the U.S. Meanwhile, half or more in four of the five Asia-Pacific nations polled give the U.S. a positive rating, including 83% in the Philippines, one of the highest ratings in the survey. The U.S. also gets high marks in South Korea, where 80% have a positive view of the U.S. and confidence in President Trump has increased over the past year from 17% to 44%. As has largely been the case since Pew Research Center’s first Global Attitudes survey in 2002, attitudes toward the U.S. in sub-Saharan Africa are largely positive, with Kenyans, Nigerians and South Africans expressing mostly favorable opinions in this year’s poll. The three Latin American nations polled offer differing views about the U.S., with Brazilians voicing mostly favorable reviews, while Argentines and Mexicans are mostly negative. And the two Middle Eastern nations in the study – Israel and Tunisia – offer strikingly different assessments. The country giving the U.S. its lowest rating in the survey, and the place where the biggest drop in U.S. favorability has taken place over the past year, is Russia. Just 26% of Russians have a favorable opinion of the U.S., compared with 41% in 2017. A 55% majority of Russians say relations have gotten worse in the past year, and the share of the public with a positive view of Trump has dropped from 53% to 19%. 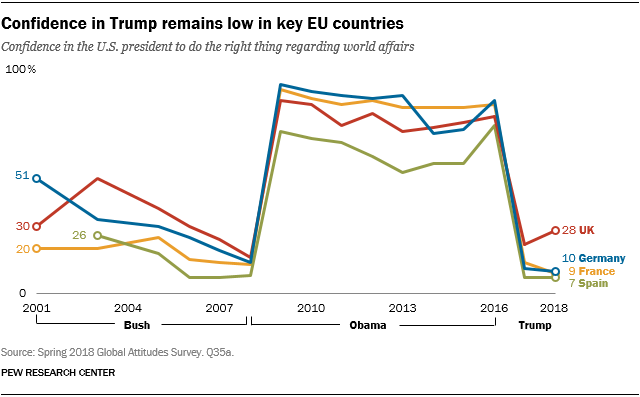 European attitudes toward Trump are strikingly negative, especially when compared with the ratings his predecessor received while in office. Looking at four European nations Pew Research Center has surveyed consistently since 2003 reveals a clear pattern regarding perceptions of American presidents. George W. Bush, whose foreign policies were broadly unpopular in Europe, got low ratings during his presidency, while the opposite was true for Barack Obama, who enjoyed strong approval in these four nations during his time in office. Following the 2016 election, confidence in the president plunged, with Trump’s ratings resembling what Bush received near the end of his second term (although Trump’s numbers are up slightly in the United Kingdom this year). In several European nations, Trump receives higher ratings from supporters of right-wing populist parties. For example, among people in the UK who have a favorable view of the United Kingdom Independence Party (UKIP), 53% express confidence in Trump, compared with only 21% among those with an unfavorable view of UKIP. Similar divides exist among supporters and detractors of right-wing populist parties in Sweden, France, Italy, the Netherlands and Germany. 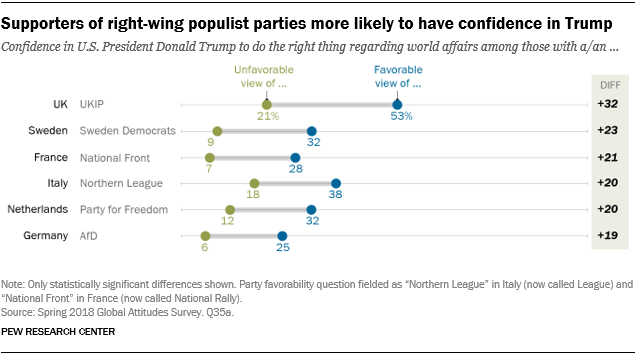 However, it is worth noting that, other than in the UK, there is no European country in which more than half of right-wing populist party supporters say they have confidence in Trump. America’s reputation as a defender of individual liberty has generally been strong in Pew Research Center surveys since we first started asking about it in 2008. The prevailing view among the publics surveyed has typically been that the U.S. government respects the personal liberties of its people, and that is true again in this year’s poll. However, this opinion has become less common over time, and the decline has been particularly sharp among key U.S. partners in Europe, North America and Asia. The decline began during the Obama administration following revelations about the National Security Agency’s electronic eavesdropping on communications around the world, and it has continued during the first two years of the Trump presidency. 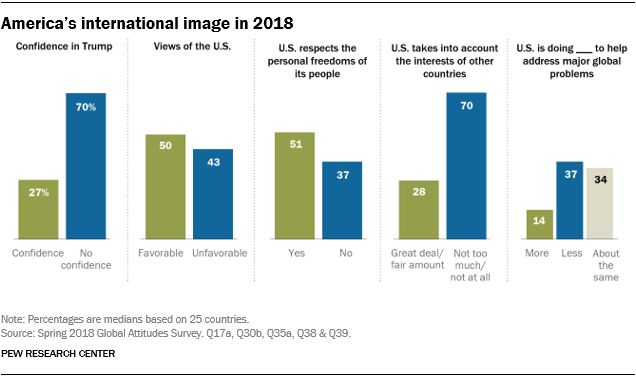 The drop is especially prominent in Western Europe, where the share of the public saying Washington respects personal freedom has declined sharply since 2013. The same pattern is found among several other U.S. allies as well, including Canada, where the percentage saying the U.S. respects individual freedom has dropped from 75% to 38% since 2013, and Australia, where it has gone from 72% to 45%. 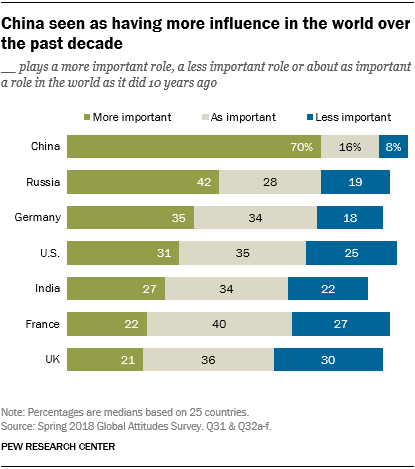 Respondents to the survey were read a list of seven major nations, and for each one, were asked whether they think it is playing a more important, less important, or as important of a role in the world compared with 10 years ago. Among the seven countries tested, China stands apart: A median of 70% across the nations polled say Beijing plays a more important role today than a decade ago. Half or more in 23 of 25 countries express this view. Many also say this about Russia. A median of 42% believe Moscow’s role on the world stage has grown over the past decade, and majorities hold this view in Greece, Israel, Tunisia and Russia itself. Overall, people are split on whether Germany’s role is greater than it was 10 years ago or about the same, but many in Europe see Germany’s role as more influential. On the other hand, Europeans are particularly likely to think the UK is less important now. There is no real consensus in views of America’s prominence in world affairs. A median of 35% believe it is as important as it was 10 years ago, while 31% say it is more important and 25% say less. Japan is the only country with a majority saying that Washington plays a less important role. Meanwhile, Israelis, Nigerians and Kenyans are particularly likely to think the U.S. is more important than it used to be. In addition to being asked about whether major powers are rising, falling or staying about the same, respondents were asked the following question about whether they would prefer the U.S. or China to be the top global power: “Thinking about the future, if you had to choose, which of the following scenarios would be better for the world: the U.S. is the world’s leading power or China is the world’s leading power?” Results show that the U.S. is overwhelmingly the top choice. The U.S. is named more often than China in every country surveyed except three: Argentina, Tunisia and Russia, although in many nations significant numbers volunteer that it would be good for the world if both or neither were the leading power. Some of America’s allies in Asia and elsewhere are particularly likely to prefer a future in which the U.S. is the top global power. Two-thirds or more hold this opinion in Japan, the Philippines, Sweden, South Korea, Australia, Canada, the Netherlands, Poland and the UK. Findings from Germany, Mexico, Canada, Japan and Israel illustrate key patterns and major differences in how foreign publics view the U.S. in 2018. Germany stands out as a country where America’s image is considerably more negative today than during the Barack Obama era. 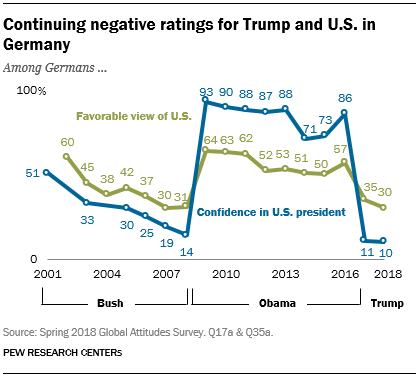 Whereas Obama was extremely popular in Germany (although his ratings did decline somewhat following the NSA scandal), only around one-in-ten Germans have voiced confidence in Trump in each of the past two years, ratings similar to those registered for George W. Bush at the end of his second term. Germany stands out on other measures as well. It is the country with the highest percentage (80%) saying relations with the U.S. have deteriorated over the past year, and it is tied with Sweden for the largest share of the public (75%) saying the U.S. is doing less to confront global problems. Germany is also where the biggest declines have taken place in recent years regarding the belief that the U.S. respects personal freedom and that Washington listens to other countries in international affairs. Mexico is where Trump gets his lowest ratings on the survey: Just 6% in the United States’ southern neighbor have confidence in him. Last year, more than nine-in-ten Mexicans opposed Trump’s plan to build a wall on the U.S.-Mexico border. This year, 66% in Mexico say relations have gotten worse over the past 12 months. 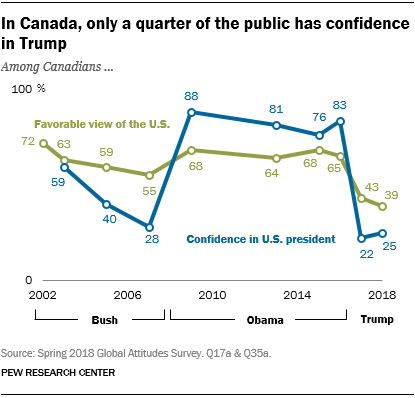 Just 39% of Canadians express a favorable opinion of the U.S. in 2018, the lowest percentage since Pew Research Center began polling in Canada in 2002. Only 25% have confidence in Trump, although he gets more positive ratings among those who feel closest to the Conservative Party (44%) than among those who identify with the New Democratic Party (17%) or the ruling Liberal Party (10%). Fully 82% say the U.S. ignores Canada’s interests when making foreign policy. Japanese trust in the U.S. president has also suffered under Donald Trump, but America’s overall image has not. 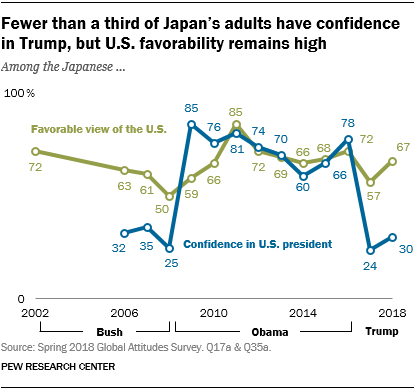 In 2018, just three-in-ten Japanese say they have confidence in Trump’s handling of world affairs, a slight improvement over their view in 2017, but significantly lower than their views of the U.S. president throughout the Obama administration. Opinion of Trump is comparable to sentiment about George W. Bush during his time in office. Fully 67% of Japanese, however, have a favorable view of the U.S., up 10 percentage points from last year. Despite the high ratings for the U.S., there are concerns in Japan about the trajectory of American power – it is the only country where a majority (55%) believes the U.S. is less powerful than 10 years ago. The rest of the report delves into these and other findings in more detail. Chapter 1 explores overall attitudes toward the U.S., America’s approach to foreign policy, whether the U.S. government respects individual liberty, and relations between survey countries and the U.S. Chapter 2 examines ratings for President Trump and other world leaders. Chapter 3 looks at opinions regarding whether specific major nations are playing a more or less important role in world affairs than in the past. Chapter 4 explores views about the balance of power between the U.S. and China, while Chapter 5 examines China’s global image. Use the tool below to explore how individual countries view the U.S. and its president, and how these views have changed over time. Keep in mind that surveys are not conducted in every country for every year. But the patterns over time should be clear, since this interactive includes all available data for the 25 countries on these two questions.